The Inner Circle prepares for a secret ambush, but Polaris is reluctant to join and Reeva tasks Esme with getting Polaris on board. Esme confides in Polaris, revealing her and her sisters’ troublesome past. Meanwhile, Thunderbird trains Reed on controlling his powers and The Purifiers attack The Mutant Underground as they attempt to rescue a group of homeless mutants. Cast: Stephen Moyer as Reed Strucker; Amy Acker as Caitlin Strucker; Sean Teale as Eclipse/Marcos Diaz; Jamie Chung as Blink/Clarice Fong aka Clarice Ferguson; Emma Dumont as Polaris/Lorna Dane; Blair Redford as Thunderbird/John Proudstar; Natalie Alyn Lind as Lauren Strucker; Percy Hynes White as Andy Strucker; Skyler Samuels as Frost Sisters/Esme, Sophie and Phoebe; Grace Byers as Reeva Payge. Guest Cast: Coby Bell as Jace Turner. Air Date: Tuesday, Nov. 6 (8:00-9:00 PM ET/PT) on FOX. 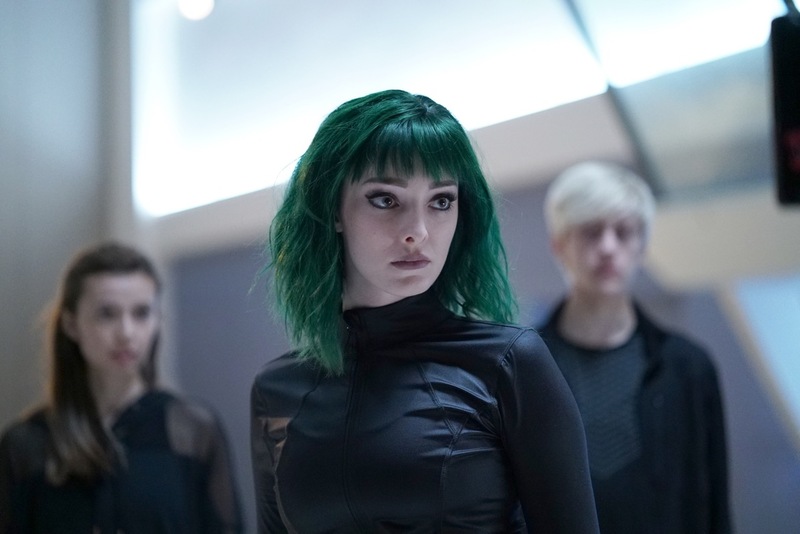 THE GIFTED: L-R: Guest star Anjelica Bette Fellini, Emma Dumont and Percy Hynes White in the "iMprint" episode of THE GIFTED airing Tuesday, Nov. 6 (8:00-9:00 PM ET/PT) on FOX. ©2018 Fox Broadcasting Co. Cr: Annette BrownFOX.